Before I get into the meat in the sandwich of this episode, I’d like to take a minute to remember the sass master Queen of Thorns, Olenna Tyrell. The conclusion of last episode was so good. Without further ado, I thought I would change things up a little bit, and quickly summarise some of the main points of the episode. Since my last episode recaps/reviews were thousands of words long, my fingers have been worn down into little skeleton stumps. The Lannisters have taken all of the money from the Tyrells to pay back to the Iron Bank of Braavos, after last episode’s siege on Highgarden. Arya returned to Winterfell! I wondered if she was heading elsewhere, turns out I was wrong. Bran is creeping everyone out with his psychic Three Eyed Raven powers. I’m looking forward to his powers being used more strategically, rather than as a cheeky gimmick. Bran’s scene with Littlefinger was a special one though, and contained some beautiful sound design. Littlefinger gave a special dagger (last seen in season one) to Bran, who later gives it to Arya because she’s the cool Stark assassin now. 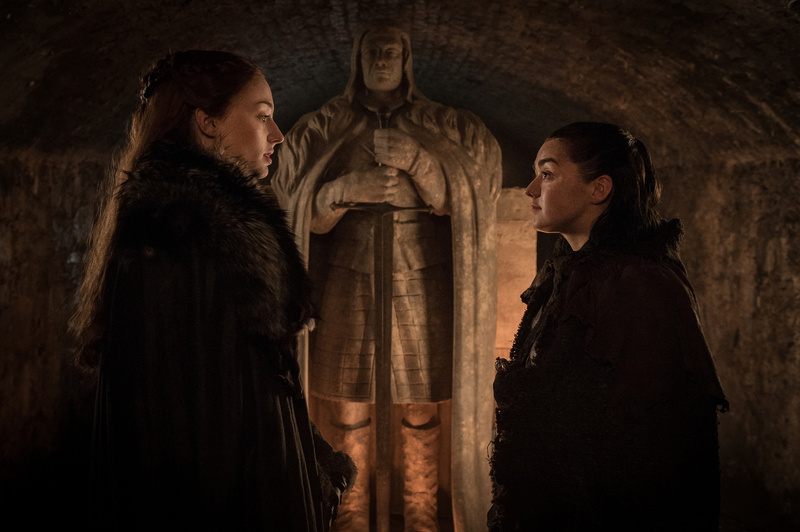 Arya and Sansa meet again in the crypts of Winterfell. Last time they were together, it was season one, and everything was in a huge shambles. Is it just me or was this meeting significantly unemotional? Sansa meeting both Jon and Bran was more emotionally affecting than this bit. It’s a slight shame. The two didn’t really get along as sisters in season one, but maybe I was hoping for something more. After seeing the trailer for this episode last week, I was excited to see Brienne in battle again but it turns out it was only sparring practice with Arya. Waste of time, even though I love Brienne with all my heart (both book and television show versions of her character). We didn’t get to see Sam Tarly and his Oldtown adventures or bad mate Euron this episode. The main action of this episode was mostly to do with the Targaryen side of the story, so I’ll elaborate on that a little bit further. Firstly, Jon Snow shows Daenerys the huge hoard of dragonglass located underneath the island of Dragonstone. Luckily, it’s enough for them to make massive, massive quantities of weapons to use against the White Walkers. 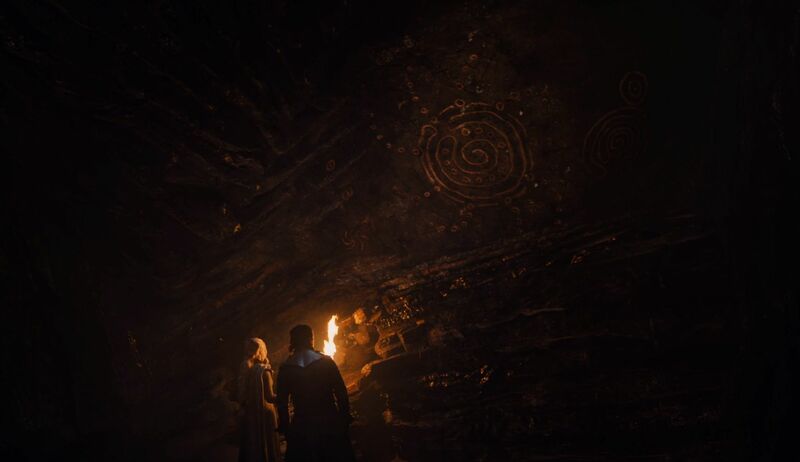 Whilst exploring the caves, Jon shows Daenerys some cave paintings/carvings that the Children of the Forest made, which illustrate their working in conjunction with the First Men against their enemies, the White Walkers. Jon uses this as an example of the fact that they need to work together against their common enemy, but Daenerys is determined that Jon and the North should bend the knee to her before that happens. I’m sure literally everyone could sense some form of unresolved sexual tension during this bit – but yet again, I have to remind everyone that Daenerys is literally Jon Snow’s aunt. Davos also explains later on that he thinks Jon has a crush on Daenerys, but Jon dismisses that. I must note that my mother watched this episode (the only episode of the show she has ever watched), and said by the end that it “wasn’t her cup of tea”, but also wanted to make a point about the suspension of disbelief involved with the cave paintings. She noted that there’s no way those paintings would have survived thousands of years in the caves because they would have been washed away by the high tide of the sea over the years, and also that ancient peoples were probably smarter than to record such important history in that silly location as well. I promised I would include her point of view on here, so there it is. Tyrion and Varys arrive and let Daenerys know that unfortunately, when the Unsullied were taking Casterly Rock, bad uncle Euron Greyjoy swooped in and ruined their fleet. Daenerys notes that it’s basically just her and the North left, since the Dornish have been ruined, and the Greyjoy fleet has been decimated, and let’s not even mention the Tyrells. Daenerys consults Jon Snow on where to go next. He encourages her to essentially listen to her heart and her people, but don’t be a reckless idiot about it. Theon returns to Dragonstone with what’s left of the Greyjoy fleet, and Jon and Theon have a little spat – remember, Theon was responsible for capturing Winterfell in season two in essentially a form of misplaced and uninformed Greyjoy pride, which also paved the way for the Boltons to take Winterfell as well. Even though Theon saved Sansa’s life, Jon is rightly quite angry with Theon for what he did back in the day. Theon wants to ask Daenerys for help to get Yara back after she was stolen by Euron and taken to King’s Landing. But Daenerys has already headed off somewhere else. It turns out that Daenerys, Drogon and her Dothraki army have headed off to the Reach to attack the Lannister army. We finally got to see one of the coolest battles of the entire series. Finally, we get to see an actual, huge dragon blasting an entire army of Lannister soldiers with fire. Also, we finally got to see the Dothraki in serious battle. Until now, we never really saw them as a united fighting force. I remember back in season one, the then-King Robert Baratheon made a vague reference to the Dothraki being extremely frightening warriors in their element, which is out on horseback in an open area. And indeed, we witness the horror of the Dothraki and their skill with war on horseback. As it turns out, they can easily hold their own against traditional ‘Western’ fighters. I must say, before writing about the actual battle, I continue to love the relationship dynamic between Jaime and Bronn. The show also made another ‘Rickon or Dickon’ joke, and I swear to god, the writers are referencing an internet joke which is difficult to explain. I just loved the inclusion of the dragon battle. It was tense, bloody, and violent. Seeing Lannister men essentially being cooked in their own armour was a mixture of terrifying and pleasing. The horror was palpable. And I loved that the use of a dragon in war was coupled with the Dothraki, strategically. 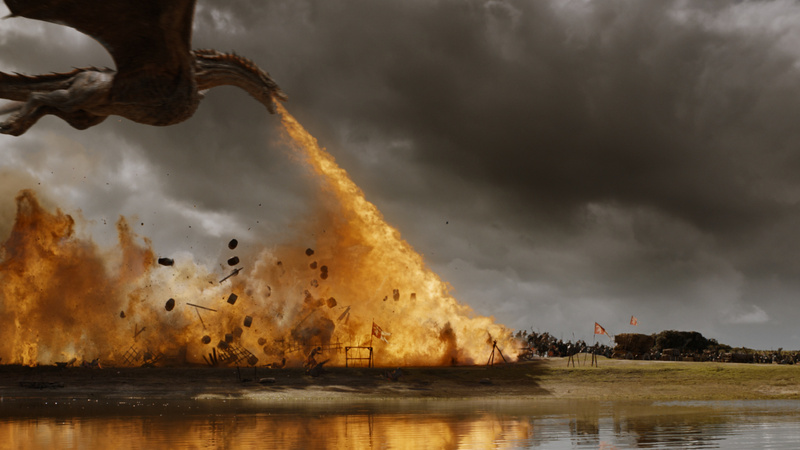 Drogon was used to burn not only soldiers in battle, allowing for the Dothraki to penetrate their layers of shields, but also to destroy the resources that the Lannisters were taking from the Tyrells in Highgarden. It’s smart. And it allowed for some beautifully shot moments of fire blasting through an ash-darkened sky, and images of bodies disintegrating into dust. The battle aspect of this episode was violently gorgeous-looking. And sound-wise, it’s really interesting how the cries of the dragon can also be given such character. There were some very interesting looks from Tyrion during this scene, when he was observing the battle. He was watching Lannister soldiers, essentially his House and family, being systematically destroyed. He looked conflicted. And I’m sure he spotted Jaime on the field and must have been worried for him. Might this complicate his allegiance to Daenerys? Amidst battle, Ser Bronn of the Blackwater is ordered by Jaime to man the huge harpoon slash crossbow weapon which Cersei and Qyburn illustrated in episode two, to kill Drogon whilst flying. 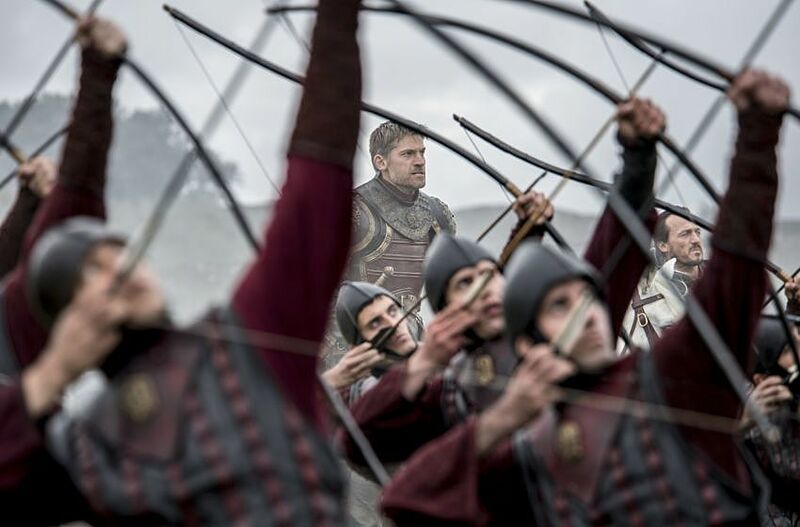 Bronn is fortunate to be a good shot, and lands the huge arrow right in Drogon’s shoulder. Drogon plummets from the sky, but manages to fire blast the weapon that attacked him, and manages a safe landing which means Daenerys is protected. The Lannister soldiers run away from Drogon, and fair enough, I probably would as well. Daenerys attempts to pull the huge arrow out from Drogon’s shoulder, ever the mother of her dragons. 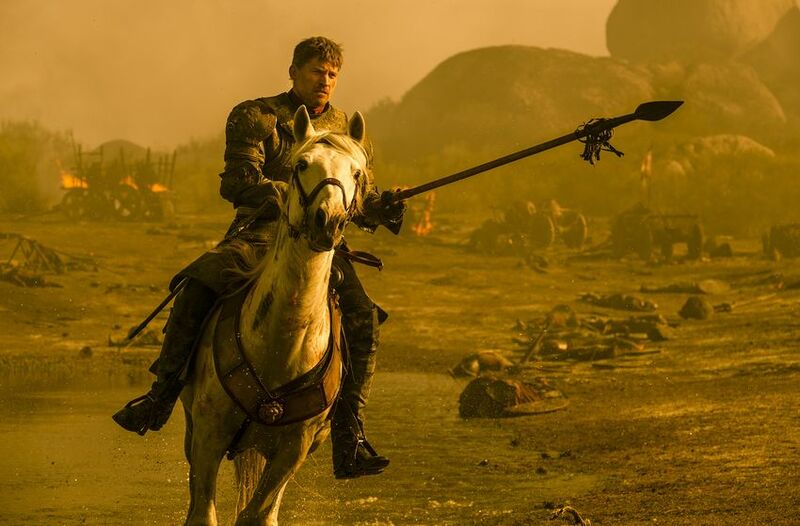 In the final moments, we see Jaime Lannister, the knight in shining armour – picking up a spear and charging at Daenerys, as if in a jousting battle. This in and of itself was a powerful image, recalling images of St George and the dragon. Jaime charges Daenerys and Drogon, and Drogon breathes fire at him with the intent to kill him and protect Daenerys. Jaime is tackled by someone (Bronn, I’m pretty sure) into the nearby lake, avoiding the fire. 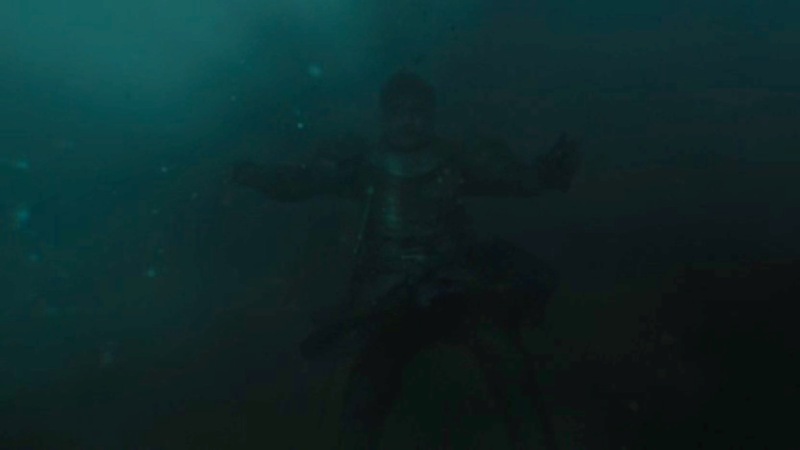 But as a result of wearing his heavy armour, Jaime sinks down into the water. Will he drown and die? Or will someone save him in the next episode? Only time will tell! All I know is, Bronn seemed to be wearing some kind of leather clothing which means he is in a nice position to same Jaime. Maybe. I hope so. Also, it must be noted that as a result of this battle, the piles of gold taken from the Tyrells may not end up making it to Cersei and the emissary from the Iron Bank of Braavos in King’s Landing. This would significantly complicate things for Cersei. If it’s just the food resources that didn’t make it to King’s Landing, that might also pose a problem, but probably not a huge one in the grand scheme of things. So, where are we at in the grand scheme of this season? It’s interesting, in some ways, the season is flying past very quickly. But some scenes continue to drag a little bit. 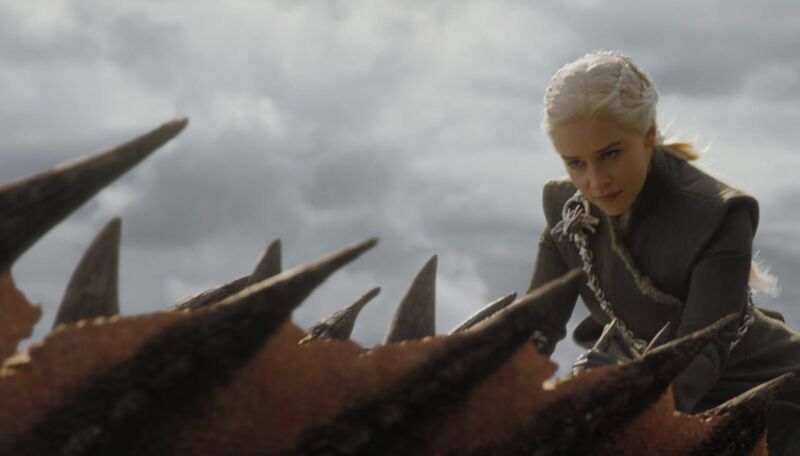 As it stands, the season seems to be whittling down storylines and focusing on three main players – the North, King’s Landing, and the Targaryen stuff (Daenerys and friends). With some extra bits around Sam’s library adventures in Oldtown. This kind of pruning was probably needed earlier in the series. What I am really loving though, is the amount of action that’s been injected into the show. Some may have criticised earlier seasons as being about people walking through the forest, amping up to something big consistently happening in episode nine, and then a predictable shocking conclusion. Season seven is flipping the script, almost because they have to. Time is limited. Not long to go now! 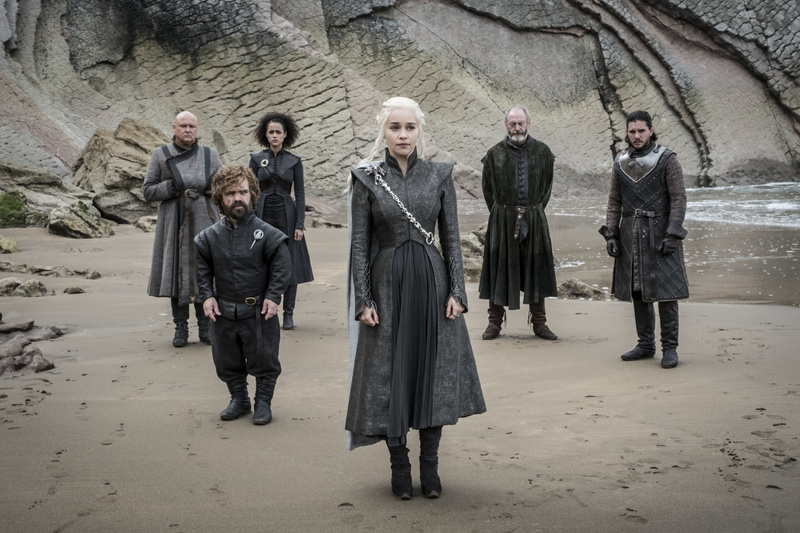 The next episode is entitled ‘Eastwatch’, and according to the trailer, it looks like we’ll be seeing more Daenerys compelling her adversaries to bend the knee and join her, Daenerys’ companions worrying about her style of ruling, Cersei’s money adventures, a whole lot of ravens leaving Winterfell indicating that an important message needs to be distributed across the realm, and Bran’s vision of the Night King and his army appearing in droves at the Night’s Watch castle Eastwatch-by-the-Sea (where the episode title comes from). Very interesting indeed. Looking forward! Thanks heaps! This was one of the best, I think. That dragon battle was breathtaking. It was an epic episode for sure! So great! Loving that we finally get to see dragons in action.